An area in the north section of Claremore was once known as RADIUM TOWN. George Eaton owned the first oil company in town. In 1903, he was drilling east of town for oil or gas. 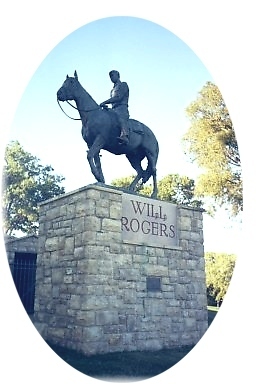 Instead, he found a "rotten-egg-smelling"
The south wing of the Old Will Rogers Library is the Lynn Riggs Memorial. Rollie Lynn Riggs was born in 1899, 3 miles southwest of Claremore in Indian Territory. He became an internationally famous author and playwright of "Green Grow the Lilacs", from which the musical "Oklahoma!" The county dedicated its first Court House in 1937, 30 years after statehood. The decision was made to purchase the property and went to the vote of the people. The bond issue failed twice but finally carried on the third try. There have been several additions to the original building.